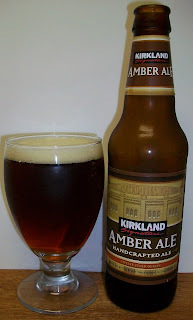 Coppery brown with rich, malty character-this perfectly brewed amber ale gets its good looks from the dark-roasted crystal malt that we import from England. To give it some Western flair, it is moderately hopped with hops straight from the Yakima Valley in Washington. ABV 5.7% Bitterness 25 IBU. Contract brewed for Costco by the Gordon Biersch Brewing Company under the brewer name Hopfen Und Malz (for the west coast market) and since mid 2009 by Matt Brewing as "New Yorker Brewing Co." (for the east coast market). Contract brewed by The Matt Brewing Company under the label New Yorker Brewing Company, Utica NY. Just on a whim I picked up a variety case of this beer at Costco the other day. I bought one of these a couple of years ago. At the time I thought the beers were drinkable but I never reviewed them. I also noticed that this case has a few new beers that were not in the old one. So the next few reviews will be me sampling my way through this case of Kirkland Handcrafted Beers. 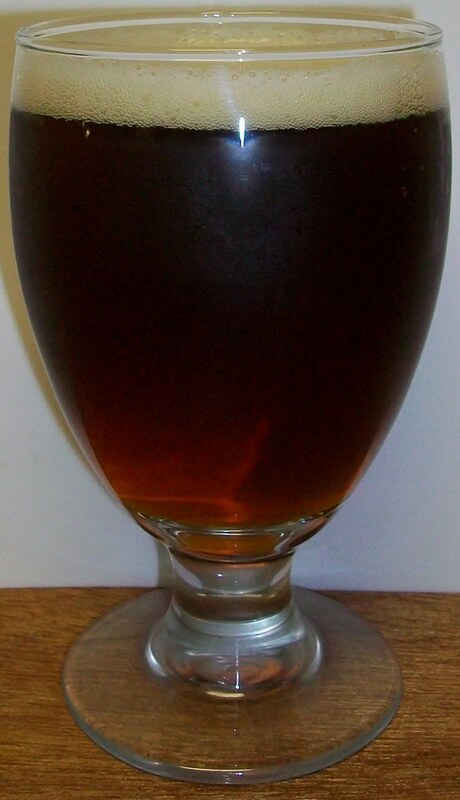 The beer pours a clear dark amber almost brown with orange hues and an off white head. The nose is modest with caramel almost toasted malt aromas with mild floral hops. Not a bad first sip. It starts out with a touch of sweetness up front then a cleansing effervescence over the tongue through the middle of the sip. The back-end is quite refreshing and very easy drinking with an effortless swallow. The finish is very nice with caramel malts and a modest hop bite. There is just a slight lingering malt sweetness on the aftertaste. I am really enjoying this beer. So far this is the best of the Kirkland case. This is really pretty good. There is nothing exceptional about it but more importantly there is nothing wrong or offensive about it either. All and all this is a very enjoyable Amber Ale and it’s warming well also. I’m going for a solid B on this one. This is a very plain but also highly enjoyable and refreshing Amber Ale. I would buy a case of just this one only.